The cats seem to have settled into the new apartment quite comfortably. One morning, Sam wanted to be picked up to watch out the oval window in the front door while the three dogs next door were loaded into the car. He watched intently and as soon as the car door was closed, he wanted down. Know your enemy, I guess. I’ve explained to him that this side of the door is his territory, and that side of the door belongs to the dogs. There is a chain link fence between their yard and ours, but I just need Sam and Scamper to know that the other side of the door is not their territory. First floor doors that lead directly outside are a new experience for us, and there is a curiosity factor. With all the new space we have, the two cats have devised a new game of Marco Polo, one at one end of the first floor and the other at the other end of the second floor. The “experts” will tell you cats don’t vocalize with each other. I’m here to tell you mine definitely do. The still do an occasional chase-me-I-chase-you, but Marco Polo is the current favorite. I think they’re figuring out the new sounds and echoes with different doors or windows open or closed and different sounds from the other side of our house or from the house next door. They certainly can tell from anywhere in the house if I touch any of their dishes in the kitchen! Sam finds the French doors a little perturbing. There are several in the apartment, including one leading to the upstairs screened porch. Doors, of course, are never supposed to be closed to cats. In summer weather, the one on the upstairs porch stays open so the cats have constant access to the porch. One morning, the two cats were on a hid-and-seek-chase-me binge and Sam got himself between the French door and the wall. he could see the other side, but it took him a minute to figure out how to get there. Windows are one thing, but a glass barrier in a place where you’re supposed to be able to walk right through and you can see where you want to be is just plain wrong. His limited vision doesn’t make it any easier for him to figure these things out. The first few times we had to close the porch door at night, we heard quite a bit of complaining from Sam. After the hot, sunny summer we had, I really got chewed out the first day it was cool and rainy and there was NO SUNBEAM! He figures his humans control everything else in his life, so we must be able to bring back the sunbeam. You just cannot understand how very sad and pathetic it is to be a boy with no sunbeam and no porch. Since the screened porches are all combination windows and the storm windows are down for the winter, on sunny days Sam and Scamper can have their porch again. In mid January, when the official temp for Concord at 8:30am was a big 4 degrees, by 10:30 on this sunny morning the temp on the porch was 60 and Sam was basking in his sunbeam. 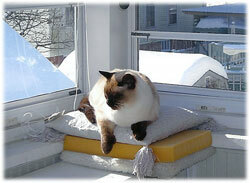 Not only does that make the cats happy, it also provides a nice supplemental heat source for the apartment. 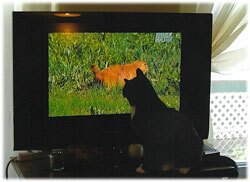 We’ve always had an issue with cats being startled and frightened by the doorbell, even a similar sounding one on TV. In this house, the back doorbell does the familiar ding-dong thing, but the front doorbell plays a gentle Westminster chimes. Every now and then when Bill an/or I come in from outside, we ring one doorbell or the other to get the cats accustomed to the sound and get them to know that it’s okay and doesn’t always bring strangers and scariness with it. Seems to be working – if I ring the doorbell but don’t go upstairs to greet the cats right away, Scamper will come down to see where I am. There’s always the possibility that food could happen. In September, Sam’s eye pressures were slightly lower that than last check and just slightly closer to equal. In November they weren’t quite as good, but still in the same general neighborhood. There was no visible sign of inflammation which was a big relief. If I see the slightest hint of pink around his eyelids, I use the homeopathic eye drops for pink eye, which brings things right back to normal. He’ll go back to the ophthalmologist in early February. His eyes look good with plenty of blue showing. (When he’s having a flare-up, his pupils enlarge and not much of the blue shows.) There’s almost no sneezing, and he’s enthusiastic about eating again, clearly feeling much better. He does occasionally get the sniffles again. When I hear him sneeze, I give him Echinacea for a few days, and a homeopathic if he really seems to be coming down with something. It reminds me that his immune system is not 100% strong. A diet change from chicken to mostly beef temporarily solved Sam’s vomit-you-breakfast-back-on-the-floor issue. It was the first time in many months he’d gone more than 10 or 12 days without this issue. At 18 days, I tried adding back in the mushroom product to boost his immune system but three days later, he was back to the vomiting. Of course he goes to the carpeted staircase to make his deposit. Fortunately with a fresh food diet there are no added colorings, so no staining, especially with a squirt of Oxyclean®. A meal skipped, a day of baby food and then back to beef and veggies. Eventually I cut out all supplements except his vitamins and calcium and I cut the vitamin dosage n half. Right away he went 3 ½ weeks without vomiting and has been doing better since then. Assuming that Sam’s now will outlast his eyesight, I’m working on finding a set of scent markers for him. I’d like an herbal scent like basil or oregano to define his eating spot, something mildly floral or fresh smelling for the door to the porch, something soothing for his bed(s). 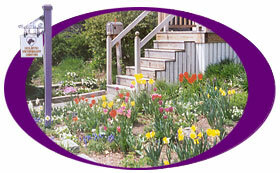 I have to decide on a delivery system (unlit candles, essential oils, herb packets, etc.) and need to keep it all low-key. Cats don’t usually like strong perfumes, and neither do I! Sam occupies my lap in the evenings and Scamper has finally taken to joining us for a while almost every night. Otherwise she sleeps in a basket in the same room. Every now and then, she decides to watch what’s on TV, sometimes patting it with a aw or trying to find what she thinks might be behind it. Her favorite show is the prairie dog town on Wild Kingdom, but she also likes the horses on the old cowboy movies. Scamper has generally avoided being touched by two hands at the same time, because that means being Picked Up, which is still downright terrifying. She’s been better about it lately, though, and got her first “two hands” Reiki treatment recently. We had company on a sunny November Sunday afternoon when Sam came downstairs to see his friend Robert and Scamper stayed hidden on the upstairs porch, where the temperature was a balmy 72 degrees most of the afternoon. Later in the evening, when the porch temp got down around 60 degrees it was time to close it up. I picked her up and carried her into the bedroom and put her on the bed --- with no squealing and no struggling! I think we were both surprised. Many people will tell you it’s impossible to tame a feral cat, that even if you get them when they’re kittens, they will always have that wild streak in them – but our affectionate Scamper is proof that that’s not true! She likes having lots of room to run. She will crouch in a doorway and when I step beside her and say “Zoom” OFF SHE GOES! It’s great fun to jump or leap from the staircase about a quarter of the way up, and since the stairs are carpeted, she can climb them at full speed. The front staircase being open, it’s also fun to flip toys through the railing and see where they land. She does get a little bored sometimes and I’ve been too busy unpacking stuff and attempting to get organized to play with her much, which she’s letting me know about! She’s still shy about strangers and has days when she’s generally spookier that other days for reasons all her own, but she is a sweet, affectionate, funny little cat who understands regular schedules, especially if they have to do with food, and is not shy about communicating her wants and wishes. The Christmas tree is a source of great pleasure for Scamper. She likes to slide on the length of white fabric I wrap around the base of the tree. It does no harm and makes her happy. We brought out her friend, the stuffed reindeer and she found a stuffed gingerbread sort of ornament and put it under the tree, which we thought was pretty cute. The next morning I saw her giving it a thorough beating. Then I realized she was chewing something which upon investigation I found to be strings from the frayed scarf on the little critter. She also tried to chew the buttons off, all of which meant I had to take it away from her. I felt so badly about it that I must have bought her six or seven toys to try to replace it, and Stacey gave her a couple of small dog toys. She thought all these things were nice, but nearly as good as the one she had found for herself! 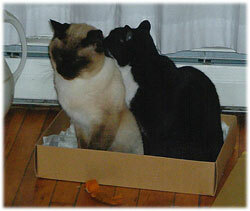 Sam and Scamper’s favorite Christmas present was a box big enough for both of them to sit in. That and the huge pile of tissue paper – great fun to dive in and play hide-and-seek with your toys in. Somehow, the next day it’s all piled back up and you can make it fly everywhere again. Sam has taken to spending a good bit of time in Bill’s lap if I’m not there or if I take to long getting my backside into the chair or if he just feels more like being with Bill. Bill is a great guy in general – easy to get along with, and cooks, too! And does the grocery shopping! When we were first married in 1983, he had no idea how to deal with cats. Little by little, the various cats have taught him quite well. He and Sam have a special guy bond. He’s willing to feed Sam grass fed local beef that we can’t always afford for ourselves, and on the chilly but sunny days when Sam can have the porch, Bill will walk home around 4:00p.m. between shifts to bring Sam inside and close the porch door against the evening chill since I don’t get home until between 6:30 and 8:30p.m. After a long day on his feet in the restaurant, Bill likes having Sam occupy his lap while he winds down. All cat people know how soothing a cat can be. Sam can even deal with Bill’s “enthusiasm” while watching ball games. Scamper still jumps and runs at loud noises, but she’ll rub her face on Bill’s hand, accept his touch and even accept two-handed Reiki from him. In early February, we’ll be going away for an overnight winter adventure. 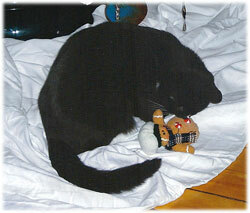 Sam and Scamper will be boarded at the Scratching Post Inn. I would be okay with leaving them home overnight, but there’s the issue of Sam’s eye drops, which Tracey at the Scratching Post can take care of, and Scamper wouldn’t be very happy at home alone. Not that she’ll be happy being boarded – this will be her first time. One night won’t be long enough for her to get comfortable – in fact, I’ll be surprised if she eats anything – but it’s just long enough for her to find out that we don come back for her. Then the following week, Sam goes for his recheck at the ophthalmologist, so we’ll have that to report on next time. 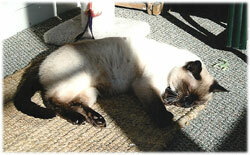 Until then, Sam and Scamper hope everyone stays warm and cozy in a sunbeam.